Bancroft (Ontario), December 1, 2013 - The Canadian Rally Championship presented by Subaru and supported by Yokohama wrapped up this weekend with the final race of the season, the Rally of the Tall Pines in Bancroft, Ontario. Run under extremely slippery early winter conditions, the contest for the win on the event and the overall Championship was extremely tense. At the finish, Ontario driver Chris Martin and American co-driver Brian Johnson were the surprise winners and Antoine L'Estage finished second overall to take his sixth Canadian Driver's title. The Rally of the Tall Pines has a reputation as one of the trickiest rallies of the season, with "winter roads and summer ditches." The 2013 edition did not disappoint, with very slippery roads and no snowbanks to help keep cars on the road. Hidden rocks under a light layer of snow led to many tire punctures. Of 33 starters, fully 20 failed to finish, the victims of mechanical failures and off-road excursions. For much of the event, it looked as though the victory would go to "Crazy Leo” Urlichich of Toronto. He and co-driver Patrick Walsh, in a Subaru prepared by Can-Jam Motorsports, were leading with only three stages left when their engine failed, denying them a second victory at the Tall Pines. Starting 19th and having never won a national-level rally, Ontario driver Chris Martin and co-driver Brian Johnson in their Old School Motorsports Subaru took over the lead after Crazy Leo’s retirement. The team was clearly at ease in the icy conditions, with driver Martin having won multiple ice-racing championships in Ontario. The team didn’t stumble under pressure and took a well-deserved first national event win. Quebec driver Antoine L’Estage and co-driver Craig Parry finished second, one minute and 51 seconds behind the winners. Having fallen to fourteenth place early in the rally thanks to an electrical problem, the team fought back mightily to gain the points needed to defend L’Estage’s national Driver’s Championship, his sixth. The only driver who could have mathematically beaten L’Estage for the Driver’s title was Patrick Richard of British Columbia, who was reunited with his sister Nathalie as co-driver for this event for the first time since 2006. The Subaru Team Canada duo were in second place behind Crazy Leo and were in a good position to secure the championship after L’Estage’s early trouble, but multiple flat tires and a subsequent driveline seizure forced them to retire. Third place overall went to Maxime Rochefort-Laframboise and Jérôme Milette in a Subaru Impreza WRX, a terrific result for the Quebec team. Despite having not competed for over a year, they resisted the pressure from Steeve Hobbs and Jean-Mathieu Tremblay to take the podium. Simon Losier with co-driver Brian Maxwell completed the top five, in front of Production Four-Wheel Drive victors Alexandre Ouellette and David Lamarre in their Subaru. In the two-wheel-drive battle, the fast Ontario team of Martin Walter and Ferdinand Trauttmansdorff in their Nissan won the class and finished a terrific seventh overall. Second place went to the father-daughter team of Jeffrey and Emily Dowell in their Mitsubishi, who also won the Production Two-Wheel-Drive class. Éric Deschênes and Catherine Asselin completed the podium and took second in Production in their Toyota. Walter and Trauttmansdorff’s victory was not enough to secure the national Two-Wheel Drive title, which went to Paul Hartl and Chuck Storry in their Volkswagen. They finished fifth in class on the event. In the national Driver’s Championship, Antoine L'Estage won the season with 107 points to Pat Richard’s 75. Third went to Max Riddle with 46 points, despite failing to finish the Tall Pines Rally thanks to several punctures. Steeve Hobbs (42 points) and Simon Losier (35 points) rounded out the top five. Rob Fagg, Subaru Rally Team Canada’s co-driver for most of the season, won the co-driver’s championship, and Mitsubishi won the Manufacturer’s title. Jeremy Norris won the Rookie of the Year honours and Emily Dowell took the Ladies’ Cup. 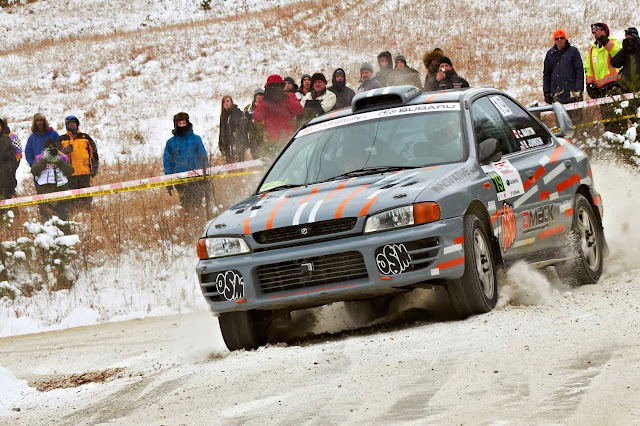 The 2014 Canadian Rally Championship will kick off on February 8, 2014 at the classic Rallye Perce-Neige in Maniwaki, Quebec. 1) Chris Martin - Brian Johnson (Subaru Impreza WRX) - 2h17'21,0"
2) Antoine L'Estage - Craig Parry (Mitsubishi Lancer Évo.10) - 2h19'12,3"
3) Maxime Rochefort-Laframboise - Jérôme Milette (Subaru Impreza WRX) - 2h20'12,7"
4) Steeve Hobbs - Jean-Mathieu Tremblay (Subaru Impreza WRX) - 2h20'51,0"
5) Simon Losier - Brian Maxwell (Mitsubishi Lancer Évo.8) - 2h30'58,0"
8) Nick Mathew - Kelly Mathew (Subaru Impreza WRX) - 2h35'18,1"